16 February 2018, Rome - Faced with the infestation of millions of hectares of maize, most in the hands of smallholder farmers, and the relentless spread of Fall Armyworm (FAW) across most of Africa, the UN Food and Agriculture Organization (FAO) launched today a comprehensive guide on the integrated pest management of the FAW on maize. The guide was developed with a host of partners: International Institute of Tropical Agriculture (IITA), International Centre of Insect Physiology and Ecology (ICIPE), Lancaster University, Centre for Agriculture and Bioscience International (CABI), Empresa Brasileira de Pesquisa Agropecuária (EMBRAPA), Colegio de la Frontera Sur (ECOSUR) and the United States Department of Agriculture (USDA). It will help smallholder farmers and frontline agricultural staff to manage FAW more effectively amidst fears that FAW may push more people into hunger. Central and Southern Africa are particularly on high alert, as the main maize growing season is currently underway in these regions. Based on a learning-by-doing approach and designed for Farmers Field Schools, the guide is packed with hands-on advice. It provides support for a correct identification of this new foe for African farmers, and offers options to manage it in an integrated, ecological and sustainable way. "We know that farmer education and community action are critical in best managing FAW, and curbing its spread as much as possible," said Maria Helena Semedo, FAO Deputy Director-General. "The guide builds on the experiences of farmers and researchers from the Americas who have been dealing with the pest for centuries as well on new technology and lessons learnt so far in Africa. It gives African farmers and frontline agricultural workers the practical advice they need to tackle FAW head-on," added Semedo. FAO also calls on those African countries likely to be affected soon, given the current distribution of FAW in Africa, to get prepared by: re-enforcing early warning systems at community level, raising awareness among farmers, and using available materials, such as the guide. By early 2018, only 10 (mostly in the north of the continent) out of the 54 African states and territories have not reported infestations by the invasive pest. "As FAW is new to Africa, farmers' and crop protection and extension workers' good understanding of the pest's behavior and management practices are crucial in effectively managing it without damaging human health and the environment," said Bukar Tijani, FAO Assistant Director-General and Regional Representative for Africa. Visit the field and look at the status of the crop: its health and signs of presence of the FAW. Farmers can take direct action by crushing egg masses and young larvae. FAW damage can look alarming, but maize plants have a good capacity to compensate for that damage and often little yield is lost. Learn about FAW behaviour. For example: understanding how and where the adult female moth lays her eggs can help determine where to plant mixed crops to prevent further spread of FAW. Understand the important role of natural biological control in managing FAW. Studies have shown that FAW suffers up to 56 percent mortality from parasitoids (beneficial insects such as tiny wasps killing eggs or larvae of the FAW) alone. Farmers must be able to recognize the FAW natural enemies and learn how to conserve and enhance them. Ants have already shown to be important FAW predators. Fields in Nigeria have already shown high levels of natural FAW mortality due to fungal and viral entomopathogens (pathogenic organisms killing FAW larvae). Farmers can ‘recycle' these naturally-occurring pathogens. Farmers can try "local remedies", including application of ash, lime, sand, or soil directly into infested whorls, already successfully used by some African farmers against FAW. Pesticides versus bio-pesticides: what should be used to fight FAW? The guide recommends that at a national policy level, information and recommendations regarding the role of pesticides in FAW management are urgently needed. The guide warns that insecticide applications are costly, may not work because of resistance, poor application techniques, or low-quality pesticides, and will negatively affect FAW's natural enemies. Although farmers may receive insecticides free this year, and maybe next, it is doubtful if they will still be receiving them in the longer-term. Alternative and sustainable solutions must be found as FAW is in Africa to stay and will be infesting maize fields for many years. The actions taken to date in most countries have been limited to the use of synthetic pesticides (especially organophosphates, synthetic pyrethroids, a few neonicotinoids, and in some cases cocktails of pesticides). In some countries, the pesticide applications were mainly emergency responses, not based on a cost-benefit evaluation. Older pesticide molecules, recognized as hazardous and banned in industrialized countries, are often still readily available and widely used in African countries. These products put farmers' health and their environments at risk. Their use may also result in pesticide residue levels that could jeopardize the marketability of crops both on domestic and export markets. Bio-pesticides, including those based on bacteria, virus, and fungus have been tested, developed, registered and used successfully in the Americas. The use of botanical and biological insecticides (certain strains of Bacillus thuringiensis (Bt), fungi and virus) to manage FAW has been reported to be effective in several sources, but bio-pesticides are not always locally available in the affected countries. Farmer Field Schools have been supported by FAO for over twenty-five years and have proven an effective approach to reaching millions of smallholder farmers and successfully engage them in a learning process resulting in better management of their crops and natural resources. FAO has been already rolling out Training of Trainers on how to manage FAW for frontline crop protection and extension in countries most affected by FAW. "With this guide, FAO will begin a continent-wide program of training master trainers to initiate an All-Africa Programme of Farmer Field Schools for the sustainable management of FAW. Over the next five years, FAO and partners aim to reach 10 million farmers through 40,000 Farmer Field Schools across Africa," said Allan Hruska, FAO Principal Technical Coordinator on Fall Armyworm. Work is also underway to launch a FAW Monitoring and Early Warning System (FAMEWS) app in Madagascar, Zambia, and South Africa, and then gradually roll-it out across the continent. Already tested, the FAO app will enable farmers to send vital info about their crops' health, helping to generate detailed and reliable knowledge on FAW infestation levels, FAW adult population levels, and on the outcomes of actions taken against FAW. FAO and its partners have been at the forefront in tackling FAW, and continue to support prevention, early warning and effective response. In addition to the FFS guide and its roll-out across Africa, FAO took immediate steps as soon as FAW was detected in Africa by: bringing together experts to share knowledge and experiences on sustainable FAW management; giving farmers and frontline agricultural workers the understanding, experience and confidence to tackle FAW; supporting countries to mitigate pest damage, develop action plans, and train extension workers and farmers. FAO also developed a Framework for Partnership for sustainable management of FAW to provide guidance for the development of FAW-related projects and programmes and ensure synergies and complementarities among the different development partners. Farmer in her FAW-damaged maize field in Namibia. FAW up close in Malawi where, in December 2017, the Government declared 20 of the country’s 28 districts disaster areas following an invasion by FAW. Native to the Americas, the insect was first detected in Africa, in Nigeria, in early 2016. By early 2018, it has spread to most of the continent. FAW can feed on some 80 crops, but it prefers maize. If left unchecked, FAW could push more than 300 million people into hunger, and lead to annual economic losses of up to $4.8 billion from maize production alone. 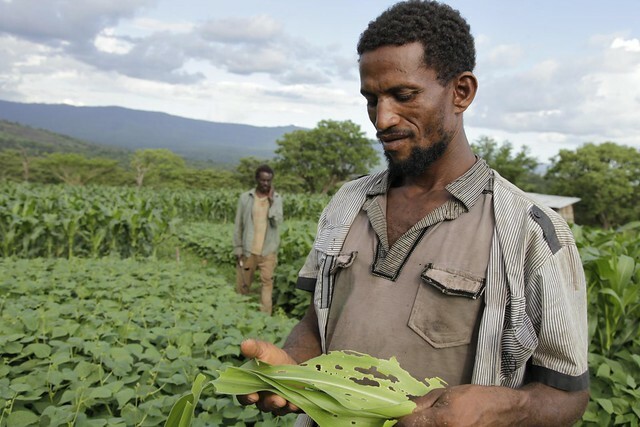 Smallholder maize farmers – like this Ethiopia farmer - with no experience of the pest, and few resources to manage it – are the worst affected by FAW. Farmers in Malawi. As part of a FFS, farmers learn how to monitor their fields; identify natural enemies that could ward off FAW; and test different measures to manage FAW.